Slate Falls Press: Freddie's Blanket- perfectly suited for a custom nursery! Freddie's Blanket- perfectly suited for a custom nursery! It is always fun to see what people decide to make from the knitting patterns in our storybooks. This recent version of Freddie's Blanket really caught my attention! When I teach the Freddie's Blanket knitting class, I enjoy sharing with my students about color and what a versatile pattern it is. It is such a great stitch for creating a custom color story to match home decor, especially, as in this case, for a new baby's nursery. Evieandlily on Ravelry recently finished this adorable version of Freddie's Blanket, including the custom pom pom garland for an extra bit of pizzaz. 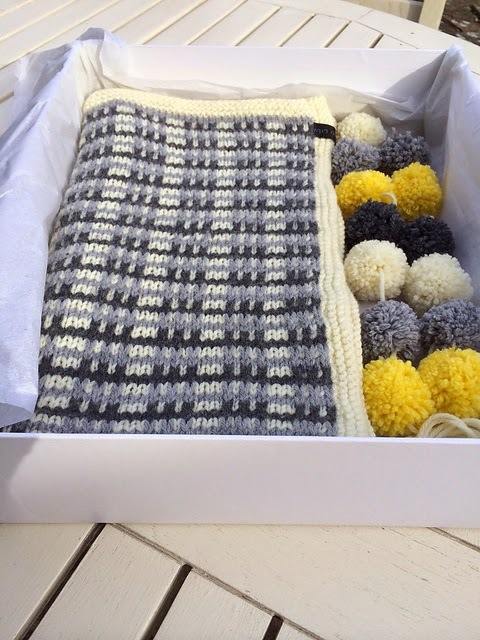 When I saw the blanket next to the photos of the nursery (gray and yellow! zebra! Boston Terrier! polka dots and elephants!) I swooned a bit. Then I quickly emailed Julie to see if she would be willing to let me share her photos with you and she was very sweet to oblige! I just love seeing a wee one welcomed into the world with such care and affection. It's why we do what we do here at Slate Falls Press! This is so gorgeous! That is one lucky baby! I agree, one very blessed little one! So sweet.